1. 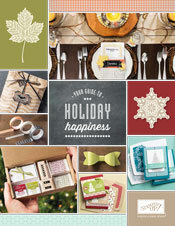 The Holiday Catalogue begins today!! This thing is full of great products, and great project ideas to go with them--there's even a new interactive feature that leads you to great video tutorials, LOVE that!! The instructions are on p.5 of the Holiday Catalogue, all you do is download the free Layar app, scan any page that has the icon on it and enjoy the video. If you're not a smart phone or tablet person, the videos can also be viewed on the Stampin' Up! YouTube page. If you would like a paper copy, let me know, if you'd like to view it online click here. 2. If you're the kind of person who likes to craft, but doesn't like to plan a project, pull all of your supplies out, cut cardstock and prep all of the materials, this is for you. My Paper Pumpkin is a magic little box that arrives at your door each month with everything you need to create a project ready to go. It includes a stamp set, an ink spot and all of the consumable materials cut and ready to go, along with an instruction sheet which includes a photo of the completed project. It could be a mini scrapbook, or a set of cards, you never know. You're able to manage your membership on-line, so you can skip a month, restart or cancel your membership whenever you like. Use the promotion code PUMPKINDEAL to join Paper Pumpkin before August 31, 2013, and pay only $12.50 a month* for the first two months. *plus tax, where applicable. Shipping included! Click here for more information. 3. Have you ever considered joining the Stampin' Up! family as a demonstrator? Stampin' Up! encourages us to each run our demonstratorship as we choose, whether you'd like to be a business builder and earn an income to support your family, or just buy things for yourself at a discount or something in between. Until the end of August everyone who chooses to join gets to choose a free project kit from the Holiday Catalogue! The starter kit is already a great deal (44% off and free shipping) and you get access to a lot of helpful resources. If you have any questions please e-mail me or leave a comment below. Click here for more information. 4. I've posted about this before, but I think carving your own stamps is a really cool idea! Express your personality, thoughts, feelings, etc. with a stamp you've carved all on your own! Click here to order undefined online. In August use hostess code HXSANPNY. 5. I've saved the best for last...Thinlits Card Dies!! These are amazing!! When these were revealed at convention the crowd went absolutely wild!! Click here to order thinlit card dies online. In August use hostess code HXSANPNY. Whew! That was a lot. If you have any questions please feel free to email me or leave a comment.